If Chad Green makes his next start at the Triple-A level and not in Cleveland, it’s a total disgrace. It’s mismanagement at its finest. It’s a total clown show. All Green needed to do in his July 3rd start to prove his value, logically, was to pitch better than Nathan Eovaldi. Showoff that he is, Green chose to pitch better than Ivan Nova and Masahiro Tanaka, too, for good measure. Sure, it was “just against the Padres.” You know, the same Padres that beat the tar out of Eovaldi, and forced Dellin Betances and Andrew Miller into subpar outings. The same Padres who scored the seventh-most runs in baseball in June. The Padres, who are a Major League team who dominated the rest of the Yankees pitching staff. Green didn’t need to dominate the Padres to impress me. But he did anyway. Six innings, three hits, one run, zero walks, and eight strikeouts. 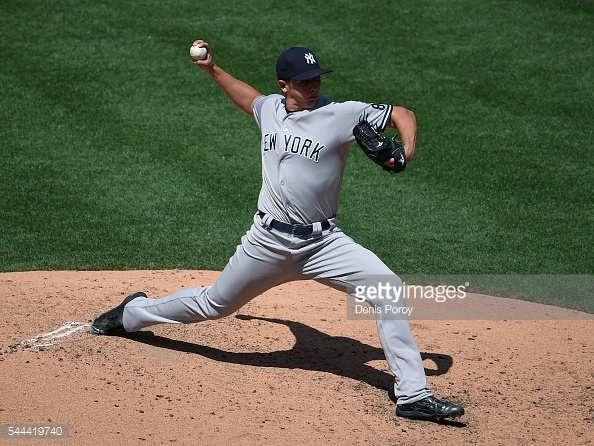 He looked better than Miller and Betances (and, uh, Anthony Swarzak). And he better have earned another shot. Because Green is 25. He’s not particularly young, as much as he is inexperienced. He’s no baby. He’s clawed his way to the Major Leagues, and now he should have an opportunity to stay. Some teams have too many rotation pieces to know what to do with them. The Yankees have a few people who might accidentally be reliable starters, and a mostly-volatile scrap heap. Green has nothing left to prove at Triple-A. I checked. He’s dominated the level like few do. 82 Ks in 81.2 innings, against only 61 hits allowed. A Kershaw-ian 1.54 ERA. I mean, yes, if you’re prepared to take control over the major league level, then you probably should be shooing away Triple-A batters, those of the Jesus Montero and Domonic Brown ilk, away like so many flies. But, uh, he did. So he doesn’t have to answer those sorts of questions. He just has to take the mound, command the zone, show off his secondary stuff (which he very much did on Sunday), and prove he’s more valuable to the big league roster than half of Justin Wilson (I’d like to think he represents his left arm, and Luis Cessa his right). Sound the “Complimenting the Red Sox” siren, but the Red Sox do an incredible job of cutting bait with people who are just not working out (unless that person’s name begins with a C, and ends with a “Lay Buchholz”). Eduardo Rodriguez got knocked around for nine runs by the Rays and continued to lose his footing, so he found himself in Pawtucket tinkering with a new motion. Nathan Eovaldi allowed more home runs in June than he did in 2015. He’s still here hoping his straight fastball doesn’t find the upper deck, against powerhouses like the league-worst Minnesota Twins. And it’s possible Ivan Nova has even less reason to be here. He wasn’t even supposed to be in the rotation at the season’s outset. It was like the Yanks had finally killed the cockroach. And then, like, one week later, there he was, back in the spotlight. He’s been positively acceptable at times, this year. And then other times, he’s looked unplayable. That’s the Ivan Nova story. Eovaldi should probably be the one losing his rotation spot to Green, but he won’t. Nova might be the one lined up to get the axe, but he won’t. Green will come up when Girardi decides to bump Tanaka an extra day (because he’s way better that way), but not when Girardi declines to bump Tanaka an extra day (because, even though he’s so much better that way, the Yankees almost never do it). At the very least, Green should be part of some sort of six-man rotation experiment. But he’ll be toiling in Scranton next week. And the worst part about it is I’m already positive I’m right.